"Today's lunch is a tomato basil pasta with meat, garlic bread, salad with cucumbers, and radishes." Instantly I was met with disdain. "What are radishes??" "I don't like radishes!" "I've tried them before. I'm not trying them again." A couple of kids even got weepy about the radishes on their plates. Now, before I continue, I'll let you in on a daycare lunchtime rule: You must try everything on your plate--a valid tasting, nibbling doesn't count. The kids know this rule. They rarely argue with this rule. Honestly, they (usually) happily give everything on their plate a try; sometimes with whining, but minimal. So on this day, just like any other day, I kindly reminded them to give them a try. Still I was met with resistance. 'Seriously, just eat the damn radishes,' I thought to myself. I took a deep breath and faced the kids. I could have easily gotten angry and told them the rules again and to stop complaining. Instead I planted a smile on my face and showed them my plate. "Look at my radishes. I put them on my salad....See? I covered my salad with them. Then I added the cucumbers and dressing. I love to eat the radishes in my salad. It really brings out the flavor in my salad. But some people don't like them in my salad. My grandpa used to pull them straight out of his garden, dust them off on his shirt, and then eat it right then and there. He loved radishes. I just started liking radishes last summer." 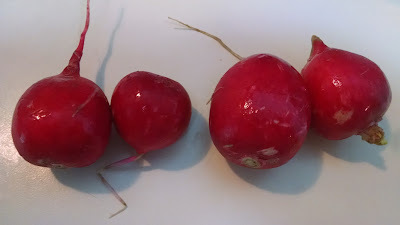 The kids began talking among themselves: "Oh yeah, my grandma ate a radish this one time..."
I quietly noticed the kids start trying their radishes. Actually the first thing they tried on their plates! A few kids put them in their salad like I did. One kids put them in her pasta to eat. The others tried them with veggie dip and ate them all. Every single radish on their plate. They turned to me excitedly. "Those were really good!" "I do like radishes!" They then proceeded to tell me what they thought they tasted like. I smiled and praised the kids for trying their new food so well. I patted myself on the back as they asked for them again next week with their salads. Often times it's soooo easy to get frustrated at meal times. Why won't they eat what they're served? Why can't things just go smoothly? Sometimes I need reminders to go at things in complete positivity. Kids observe so much and play off of the energy they're met with. I can guarantee that if I had at this situation differently, the results would have been completely different. By being absolutely positive, the kids not only stopped and really listened to what I was saying, but they actually ate the radishes (and ate second and third helpings of them). I still stuck to our lunchtime rules, but enforced them in an entirely different way. It's not really about the radishes. I really could care less if they had only tried their bites and then said they didn't like them. This small scenario was about connecting with the kids and POSITIVELY affecting their choices. They are watching, they do listen, and they will give things a chance.